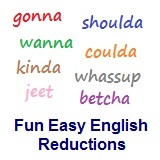 ﻿ Fun Easy English - new-american-english-reductions-reduced-words-topic-word-you-what-did-you-whajya. In this lesson you will learn the American English reduction whajya. Whajya think of the football game today? Whajya find on the beach today? Whajya think of the food at this restaurant? Whajya is an American English reduction often used in casual conversations. Reductions, such as whajya are not real words in English.